Over the holidays I received the gift of free time, and spent a fair amount of it going through photos from Felkerino’s and my 2015 summer bike tour of Idaho and Montana. In retrospect, it appears we had a grand adventure. While it was happening, our good times were interspersed with humbling moments and some formidable gravel sections we were ill-prepared to ride. We rode them anyway, and now know to respect the granite sand-gravel of Idaho. Some of my favorite parts of this tour were spent paralleling rivers. The Lochsa and Salmon Rivers– they spoke to us, and their lively company engaged us on otherwise mostly empty segments. We also had sparkling blue sky for most of our time on the road, and appreciated many views of uninterrupted sky as we pedaled between the aloof Idaho ridges. I like to have one post from each tour that summarizes our experience and provides links to the daily writings from the road. Over our 11 days of riding, we rode 897 miles. That’s an average of 81 miles per day. This tour was not as hilly as our Colorado tours, but enough hills for my fitness level this year. 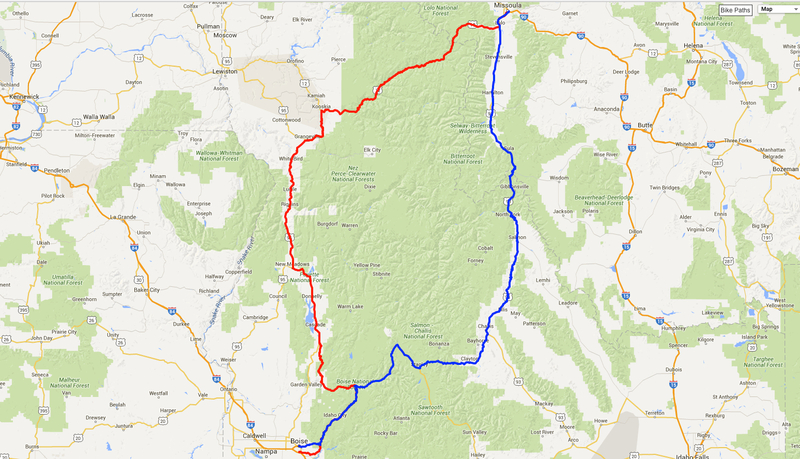 Assembling this post made me thirsty for more bike touring. Here’s to a happy and healthy, bike-filled 2016! Me too. I’m already planning for the spring events and #3 son and I have our annual bike tour down to two prospect. Cape Cod and the Island or the Erie Canal. Enjoy your 2016 bike ride.